Most in-game currencies price was decreased in April especially Guild Wars 2. This month alone, Guild Wars 2 price dropped more than 50% making it to be the worst month in its RMT history. SWTOR suffered the same fate as well. FFXIV and Blade and Soul in-game currencies price also had severe price decline. EVE Online and, surprisingly, WildStar Online are the only two games in our list that almost have the same price as in March. 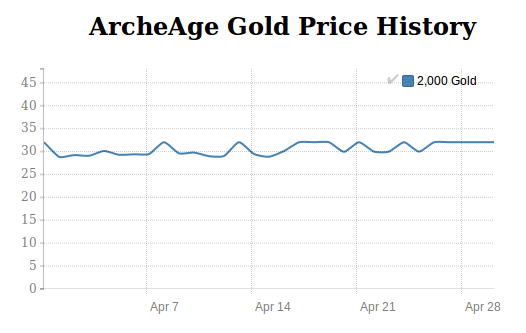 Although ArcheAge Gold price in April had been up and down throughout the month, its in-game currency price was always in the range of $30 per 2,000 ArchAge Gold as predicted in our March RMT Roundup. Actually, ArcheAge Gold had been staying in this range for the whole 3 months starting from February after the release of patch 2.5 “Bloodsong”. Looking at ArcheAge news, there haven't been much update on the site as well. This brings doubt that what will be the next update of the game. 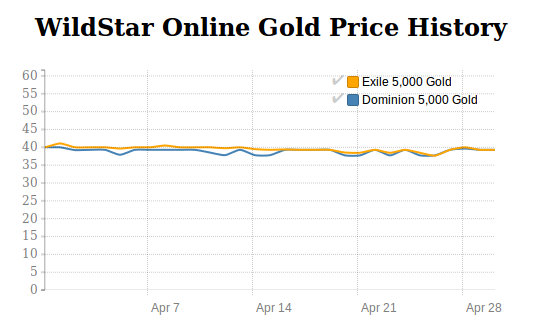 Because of this, ArcheAge Gold price have a tendency to be slightly lower in May. The cheapest Archege gold was on April, 01 2016, which is 2,000 ArcheAge gold for (US) $28.84 and the most expensive was on April 29, 2016, for $32.03. The discrepancy rate was only at 16.92%. EVE Online ISK price did not have any change much although the game was already released for several years. In April 2016, its ISK price was almost unchanging at all, staying in the rate of $36 USD per 2bn ISK for the whole month. The is definitely not what we expect to see since it just had EVE Fanfest 2016 between April 21-23 in which normally should raise the RMT price. With this in mind, it is highly possible that EVE Online ISK price will be in this range again in May no matter it just released the Citadel update on April 27. The cheapest was on April 08, 2016, which is 2bn EVE ISK for $35.49 and the most expensive was on April 26, 2016 for $36.00. It is only 1.44% different. Guild Wars 2 Gold reached its lowest RMT price in history after its release back in 2012. 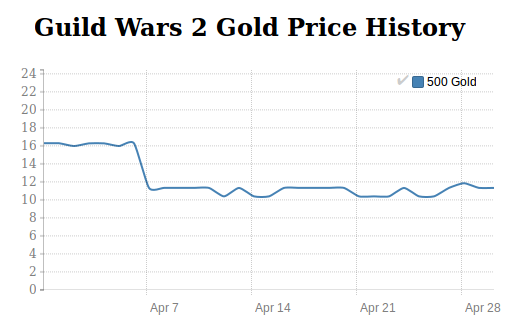 Currently it costs only ~$11 USD per 500 Guild Wars 2 gold because of its severe sudden 30% decline on the second week of April. This price is over 200% lower than it was before 6 months ago. One main reason from this heavy drop was from its new several interesting items on the gem store, the official GW2. But we could not deny the fact that there shouldn't be much demand in Guild Wars 2 anymore since the game barely had have new contents at all although it released for several years already. We will remove Guild War 2 from our RMT Roundup very soon. There's still no factor to help increase the GW2 Gold price by far. The cheapest was on April 23, 2016 which is 200 Guild Wars 2 Gold for $10.39 and the most expensive was on April 03, 2016 for $16.28. It's a significant 56.69% decrease. SWTOR US Credits current situation wasn't much different that Guild Wars 2 much: suffered from the dramatic decline and now reach the lowest price in history. However, SWTOR have a very strong point that no other MMOs can compare: its long rich history from the epic movies. And this year there's going to be another new Star Wars movie which should have a great impact on SWTOR, like it did before last December. Of cause, this isn't an only factor that can keep the game alive. BioWare team still added new more contents to the game to keep current players active. With these two factors, SWTOR RMT market should still be popular for a while although the game was launched 5 years ago. The cheapest was on April 28, 2016 which is 10mn SWTOR US Credits for $11.99 and the most expensive was on April 15, 2016 for $15.98. The declined rate was still as high as 33.28%. Thanks to the good marketing campaign from Enmasse, Tera can still keep it's gold price to be in the range of $25 USD per 20,000 Tero Gold as predicted by our last month roundup. And the marketing strategy in April was even beyond imagination. The game made a business partner with Celio causing it's able to add the popular "Hello Kitty" into the game. This is not what we see much even from the MMOs market. If this partner thing goes well, we should see more famous cartoon characters tied in the game. Tera should have some more marketing plans in their hand causing its RMT price to be higher in May. The cheapest was on April 11, 2016 which is 20,000 Tera Gold for $22.04 and the most expensive was on April 29, 2016 for $25.98. It was 17.99% different. The average WildStar US Gold price in April was quite the same as at the end of March, around $39 USD per 5,000 WildStar Gold. Although WildStar in-game currency price was updated almost daily, the change in price was always less than 4%. This month the game only had an update related to in-game store especially the Darkspur Store update adding several in-game items and months. The next WildStar update is still nowhere to be found. The cheapest was on April 25, 2016 which is 5,000 gold for $38.46 and the most expensive was on April 04, 2016 for $40.00. The discrepancy rate is as minimal as 4%.